St. Cynog was the eldest son of King Brychan of Brycheiniog, by Banhadlwedd, the daughter of the Irish King Banhadle from around Llanrhaiadr ym Mochnant in Powys, whom he violated while a hostage at the Powysian court. She presumably returned with Brychan to Brycheiniog, for Cynog is said to have been born at his father's Royal court at Caer Efong (Y Gaer). Brychan had him baptised and gave him a heavy iron 'torc from heaven,' covered in gold, which he had worn on his arm. Cynof wore it on his head. His maternal grandfather was probably expelled from Powys by St. Germanus, for Cynog was later offered his crown, but only over his Irish dominions. 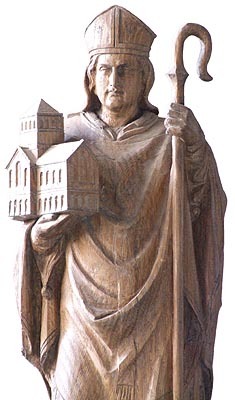 The saint refused, but was, at times, appointed governor of Brycheiniog during his father's absence. In his youth, Cynog retired from his father's court to a hermitage not far from the Brecon to Battle road, about a mile from Caer Efong (Y Gaer), his father's capital. He spent his life ministering to the religious needs of the people of Brycheiniog, as well as making sojourns to other Welsh kingdoms where churches dedicated to him may still be found. He even travelled over the Bristol Channel to Cerniw (Cornwall), staying for some time at Both-Cynog (Boconnoc), near some of his siblings. At Caer Wedros in Ceredigion, a young widow begged him to save her and her children from the ravaging 'ormests' (or invaders), a race of cannibal giants who inhabited the hills and the woods and attacked the locals at night. Cynog resolved to stand guard, praying at the woman's door until morning. When, the ormests arrived, the saint persuaded their chief to spare the woman and her family in return for allowing him to cut a large slice of flesh from the saint's own thigh. The chief giant, relishing such a delicacy however, came back for more the following night. Divine intervention inspired Cynog to defend himself with his torc and, striking his opponent with a heavy blow to the head, he slew him. His followers fled and were never seen again. "A sheep's white wool" is later said to have grown over Cynog’s own injury. Years later, a blacksmith and his friends were scoffing at the story of the giant's 'death-by-torc', when St. Cynog passed by. The blacksmith snatched the holy torc from him and struck it upon his anvil in scorn, exclaiming that it never killed an ormest. At that moment, a little splinter of metal flew out from the torc and pierced the smith's brain so that he immediately dropped down dead! In later life, St. Cynog was desirous of a more stable form of solitude, so he joined a community of religious men leading an organised hermitical life upon Y Fan Oleu (the Van), a mountain in the parish of Merthyr Cynog. There he built him a small hermitage under a steep rock near the mountain's summit. Cynog and his fellows lived by the labour of their hands and had no water except that which they fetched from the river at the foot of the mountain. The hermits continually bemoaned the long climb back up the steep hill, but Cynog underwent the journey very cheerily and reprehended the others for their sloth; for he considered such labour holy in itself. Thus the other hermits came to resent Cynog's presence. Resentment soon turned to hatred when the Lord sent Cynog a miraculous spring above his little cell, in consideration of his aged state. The hermits resolved to murder poor Cynog in order to gain access to his water supply. Mounting the rock one Sunday morning, 8th October, they found him at prayer, his feet in the crystal spring. They ran at him furiously and cut off his head with a sword, which was then dropped into the well. As Cynog's head also hit the water, the spring immediately dried up. The saint, however, continued to walk about with his head, first hanging from his body and then taken up by his hands. He carried it down the hill and onto some rising ground. At this point, one of the hermit's snatched Cynog's famous torc from under his habit and the saint dropped his head under a bramble bush. He was buried at this spot and the old parish church of Merthyr Cynog was raised as a martyrium over his grave.